It’s a Comic Art Friday the 13th, but you know what? I’m feeling lucky. When I feel lucky, I turn to my signature commission theme — Common Elements, in which otherwise unrelated comic book characters who share some… well… common element meet up on the drawing table of a talented artist. Today, Brazilian superstar Al Rio finds two star-crossed superwomen engaged in a merry chase. Leading the parade at right is Star Sapphire, the long-time nemesis-slash-paramour of Hal Jordan, best known of the numerous heroes who’ve borne the title Green Lantern. 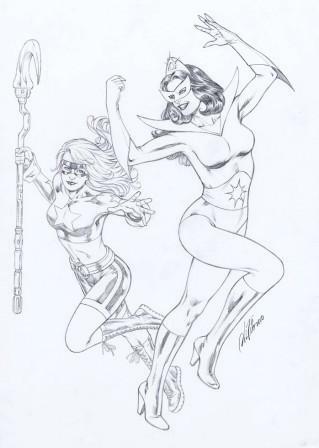 In hot pursuit at left is Stargirl, one of the youngest members of the current incarnation of comicdom’s senior superteam, the Justice Society of America. Star Sapphire, like Carol (Ms. Marvel) Danvers and Dr. Bill (Goliath) Foster, is one of a handful of characters whose civilian identities were well established in comics before they adopted their costumed identities. In this instance, Carol Ferris had been around for three years in Green Lantern’s storyline as both the owner of the company that employed Hal Jordan as a test pilot and as Hal’s on-again, off-again girlfriend. Then, when an alien gemstone endowed Carol with Green Lantern-like powers, she took on the name Star Sapphire. Unfortunately for Hal, the influence of Carol’s power gem also turned her into a villainess — one of his primary adversaries for the rest of his career. Courtney Whitmore, like many of the JSA’s present-day lineup, is a legacy — that is, she came into the superheroing fraternity by way of a prior connection. In Courtney’s case, her stepfather Pat Dugan enjoyed an adventuring career as Stripesy, the adult sidekick to the adolescent Star-Spangled Kid. Many years later, teenaged Courtney took up the Kid’s costume and nom de guerre. To keep Courtney from getting her inexperienced self killed, the mature Pat donned an Iron Man-like exoskeleton of robotic armor to become his stepdaughter’s partner and guardian, S.T.R.I.P.E. In time, Courtney received the cosmic staff of Jack Knight, the second Starman, and changed her code name to Stargirl in Jack’s honor. For this Common Elements commission, I offered Al Rio three possible pairings from which he could select. I wasn’t surprised, given Mr. Rio’s predilection for attractive females, that he chose these two scintillating “stars” for his newest creation. I was, however, most pleased by the result. There’s a reason why Al is one of the pencilers most represented in my collection — that reason is on eye-catching display here. Yes, it’s Friday the 13th, but have no fear — the stars are in alignment. This entry was posted on August 13, 2010 at 8:50 pm and is filed under Comic Art Friday. You can subscribe via RSS 2.0 feed to this post's comments. You can comment below, or link to this permanent URL from your own site.